Discussion in 'China & Asia Pacific' started by layman, Jan 18, 2014. Taiwanâ€™s new air-to-ground cruise missile could play a major role in any military confrontation with China. The Taiwanese Air Force on January 16 unveiled a new air-to-ground cruise missile that could play a major role in any military confrontation with China. Known as the Wan Chien, or â€œTen Thousands Swords,â€ the cruise missile was developed by the military-run Chung Shan Institute of Science and Technology (CSIST). Although serial production is not expected to begin until 2015, the missile is believed to have entered service on Aerospace Industrial Development Corpâ€™s (AIDC) F-CK-1 Indigenous Defense Fighter (IDF) following a mid-life upgrade program. Thursdayâ€™s ceremony, held at Tainan Air Force Base in Southern Taiwan, marked the completion of the Hsiang-Chan Project â€” a mid-life upgrade for the 71 IDFs in the 443rd Tactical Fighter Wing, based in Tainan. Another 56 IDFs, part of the 427th Tactical Fighter Wing in Taichung, are also expected to undergo upgrades starting this year, a project that is scheduled for completion in 2017. By then, all 127 IDFs will be Wan Chien-capable. Initiated in 2006, the Hsiang-Chan Project IDFs underwent modernization in three principal areas, namely the aviation operating system, which now runs on a 32-bit platform, up from 16; in-air electronic equipment; and radar systems. A new tri-color multi-function heads-up display will enhance ease of navigation, while a software update for its radar system, developed by Han Shiang Corp, enables the tracking of multiple targets simultaneously and provides countermeasures against electronic jamming. 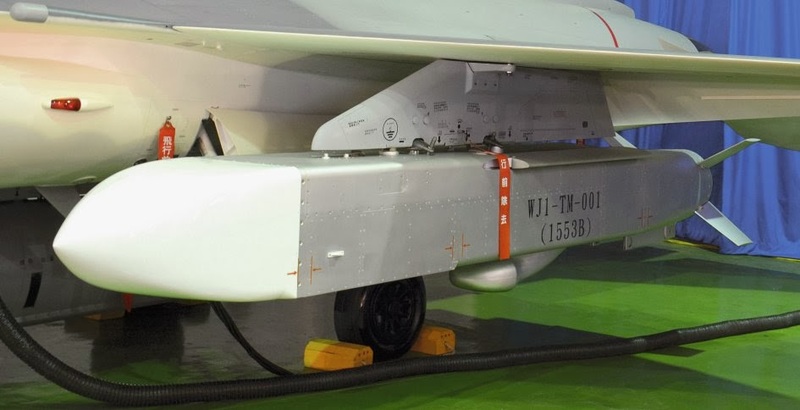 The upgraded IDFs can now carry four air-to-air missiles, against two initially, and are now armed with the Tien Chien II â€œSky Sword.â€ Efforts are ongoing to also equip the aircraft with Tien Chien IIA anti-radiation missile. Although improvements were also made to the aircraftâ€™s avionics, the initial twin Honeywell F125-70 afterburning turbofan engines remain unchanged. Perhaps the most significant aspect of the upgrade is its focus on enhancing the IDFâ€™s ability to attack ground targets with the Wan Chien, a Joint Standoff Weapon (JSOW) whose capabilities have been likened to Raytheon Corpâ€™s AGM-154 JSOW and the Storm Shadow, jointly produced by France and the U.K. The missileâ€™s range of approximately 200 km means that it can be launched outside the envelope of existing air-defense systems deployed along the southeastern coast of China (longer-range systems like the S-400, which the Peopleâ€™s Liberation Army hopes to acquire from Russia, would likely be limited to major urban centers and critical military infrastructure), using a GPS-inertial navigation system to home in on its target. Although the Taiwanese military has shied away from designating it as such, the Wan Chien is predominantly a delivery device for cluster bombs, with Chinese airstrips as the primary target, although other sites, such as radar installations and missile bases, are likely candidates. The Wan Chien joins a number of weapons acquired or produced by Taiwan in recent years that are considered offensive in nature, such as CSISTâ€™s Hsiung Feng IIE (HF-2E) land-attack cruise missile (LACM), which has entered serial production, and the submarine-launched Harpoon UGM-84L cruise missiles the Taiwanese Navy received in late 2013 (the â€œLâ€ designates the capability to attack littoral targets, including port infrastructure, power grids, and military staging grounds). Despite relative improvements in relations between Taipei and Beijing since the election of Taiwanese President Ma Ying-jeou in 2008, the Taiwanese military has persevered in its efforts to procure or develop the means to attack targets in China (the ground-launched HF-2E has an estimated range of 650 km). Also noteworthy is the fact that the United States, the islandâ€™s principal ally and source of defense technology, seems to have toned down its opposition to Taiwan putting its hands on offensive technology (though we could argue that even offensive articles remain defensive in nature, as Taiwan will not initiate hostilities). The U.S.â€™s attitude perhaps comes from the realization that dÃ©tente notwithstanding, China has continued to bolster the military capabilities it would need to threaten the island with use of force. The Taiwan Air Forceâ€™s first joint standoff weapon (JSOW), unveiled at a ceremony last week, is intended to suppress enemy air defenses and should complicate any invasion plans China might have in mind, a defense expert said. The indigenous defense fighter â€œGohawkâ€ combat jet includes new avionics, radar, a head-up display and the air-launched Wan Chien. This is the first precision weapon of its kind for Taiwan, said Eric Shih, a Taiwan defense specialist. â€œChina should be afraidâ€ should it decide to invade, he said. Washington has resisted selling Taiwan what it terms â€œoffensiveâ€ weapons, although China deploys many against Taiwan. A US defense industry source said the MND has reached a â€œstate of panic,â€ with MND officials complaining the US has refused to provide Taiwan with new F-16 fighter jets to replace its fleet of aging Mirage 2000 and F-5 fighters. The US has withheld fulfilling Taiwanâ€™s request for 66 new F-16C/D fighters since 2006, and the 2011 release of an upgrade package for 145 F-16A/Bs could be derailed by US defense budget cuts that endanger the US Air Forceâ€™s Combat Avionics Programmed Extension Suite program for its own F-16s. Indigenously produced weapons could be Taiwanâ€™s only answer to continued lobbying by China in Washington to suspend future arms sales to Taiwan. The Wan Chien gives Taiwan an advantage, as it is an â€œindigenously developed capability, which gives Taiwan an added degree of independence of action, if the capability should ever have to be used in anger,â€ Fu Mei said. The Wan Chien follows the recent deployment of Taiwanâ€™s first land-attack cruise missile, the Hsiung Feng 2E, outfitted on mobile trucks. The trucks have been disguised as commercial delivery vehicles.